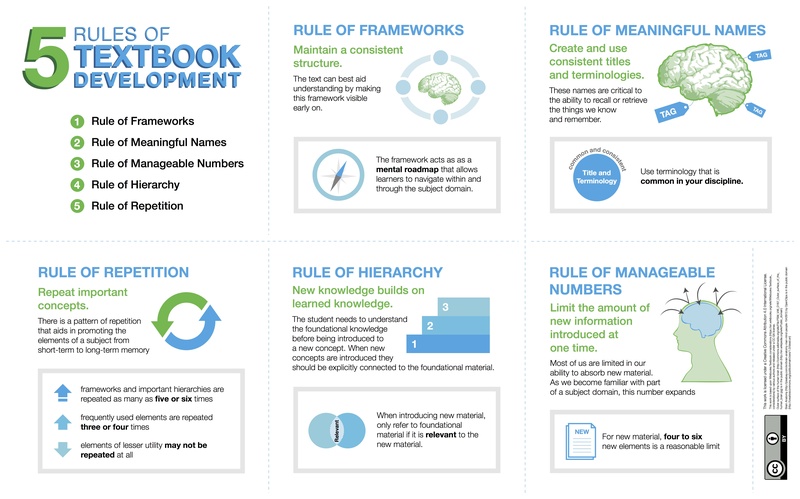 There are five rules that guide the development of a good textbook. Memory and understanding are promoted by the use of a structure that mimics the structures we all use within our minds to store information. Before we can use or master a subject, we have to have a mental road map that allows us to navigate within and through the subject domain. The text can best aid understanding by making this framework visible early on within each section or topic. The extent to which the student understands that they are using a framework, and knows what that framework is, is important as they internalize and make use of the material presented. 2. Rule of Meaningful Names. Everything we know is tagged with an index or a title. These indices are critical to the ability to recall or retrieve the things we know and remember. Each concept, process, technique or fact presented should aid the student to assign a meaningful name for it in their own mental organization of the material. To be most useful, these names shouldn’t have to be relearned at higher levels of study. The names assigned by the text should be useful in that they support some future activities: communication with other practitioners, reference within the text to earlier mastered material, and conformity to the framework used for the subject. Each unique element of the subject domain should have a unique name, and each name should be used for only one element. 3. Rule of Manageable Numbers. When we learn from an outline, an illustration, or an example; most of us are limited in our ability to absorb new material. As we become familiar with part of a subject domain this number expands, but for new material four to six new elements is a reasonable limit. If a chapter outline contains 12 items, the student will have forgotten the outline before getting to the last item. When a text fails to support this rule, it requires even a diligent student to needlessly repeat material. Our mental frameworks are hierarchical. Learning is aided by using the student’s ability to couple or link new material with that already mastered. When presenting new domains for hierarchical understanding, the rules for meaningful names and manageable numbers have increased importance and more limited application. A maximum of three levels of hierarchy should be presented at one time. The root should be already mastered, the current element under consideration clearly examined, and lower levels outlined only to the extent that they help the student understand the scope or importance of the current element. This area is supplemented by two more rules within this rule: those of Connectivity and Cohesion. Connectivity requires consideration of what the student likely knows at this point. The more already mastered elements that one can connect with a new element, the easier it is to retain. Cohesion requires that the characteristics of new elements as they are presented be tightly coupled. Most people learn by repetition, and only a few with native genius can achieve mastery without it. There is a pattern of repetition that aids in promoting the elements of a subject from short-term to long-term memory. Implementations of this rule may mean that frameworks and important hierarchies are repeated as many as five or six times, while frequently used elements are repeated three or four times, and elements of lesser utility may not be repeated at all. The first repetition should normally occur within a day of first presentation, followed by a gradually decreasing frequency. Exercises and review sections are ideally contribute a designed repetition pattern. Textbook Considerations from Wikibooks is used under a CC-BY-SA license. Structuring your Open Textbook by BCcampus is licensed under a Creative Commons Attribution 4.0 International License, except where otherwise noted.